Imagine a future in which the art world refers to our slice of Florida as the Glass Coast, because it’s frontloaded with artists, galleries and museums dedicated to the American studio glass movement. The future, according to Imagine Museum executive director Jane Buckman, is now. Open for just a year, the 48,000 square foot facility is the latest – and the most visible – example of St. Petersburg’s expanding embrace of this relatively new form of delicate, three0dimensional, light-infused sculpture. Between the Morean Art Center’s extensive collection of pieces by Dale Chihuly, the working studios and galleries of Duncan McClellan, Zen Glass Studio and others, the whole Glass Coast designation was already being bandied about when Imagine’s (glass) doors first opened on Jan. 27, 2018. 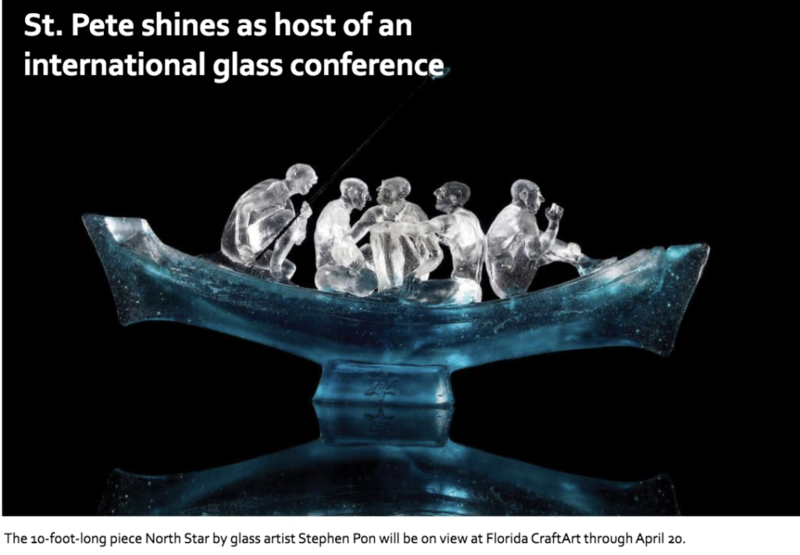 The international Glass Art Society (GAS) conference comes to St. Pete March 28-30, giving the area even more validation. Approximately 1,000 glass artists, educators and students will descend on St. Pete, and their itinerary includes visits to all the “glass houses” in town for demonstrations, discussions and more. The Imagine Museum was brainstormed, bought and built by billionaire businesswoman and philanthropist Trish Duggan, a relatively new arrival to the Clearwater area. 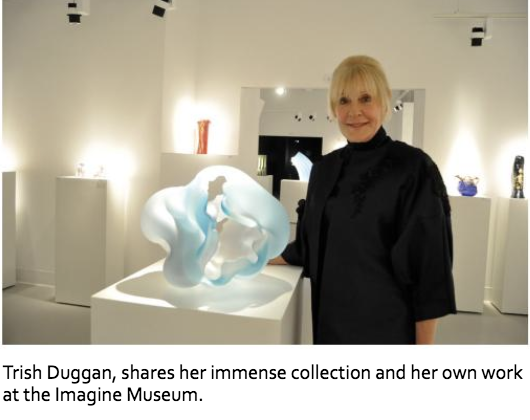 Among her many artistic passions, Duggan is an aficionado of glass art – she is, in fact, a talented creator herself in the tricky and temperamental medium. She bought the building at 1901 Central, the former home of the Imagine Charter School (Duggan liked the name, so it stayed) and formed a nonprofit. The collection, which numbers more than 500 pieces, was curated by Corey Hampson, of Michigan’s Habatat Galleries. Duggan tasked Hampson, a nationally-recognized scholar and expert on glass art, with creating a timeline – tracing the history of the American glass art movement, which began in the early 1960s – and to locate pieces that reflect the change ad innovation in glass art over time. This he did. And Duggan bought every piece, and had it all shipped to Florida. Duggan, who is the chairman of the museum’s small board of directors, is paying for everything herself. That’s how strongly she believes in the art – and in the community. Is St. Petersburg the future of glass? The Glass Art Society thinks so.